Mix and Chic: Creating major impact using unexpected bold wall color. Creating major impact using unexpected bold wall color. Using a moody brown wall in a dining room surrounded by classic painting and abstract art with two modern, streamlined adjoining light wooden tables, modern and delicate dining chairs and a patterned brown rug and a gorgeous classic chandelier with a modern twist oozes eclectic, sophisticated chic. 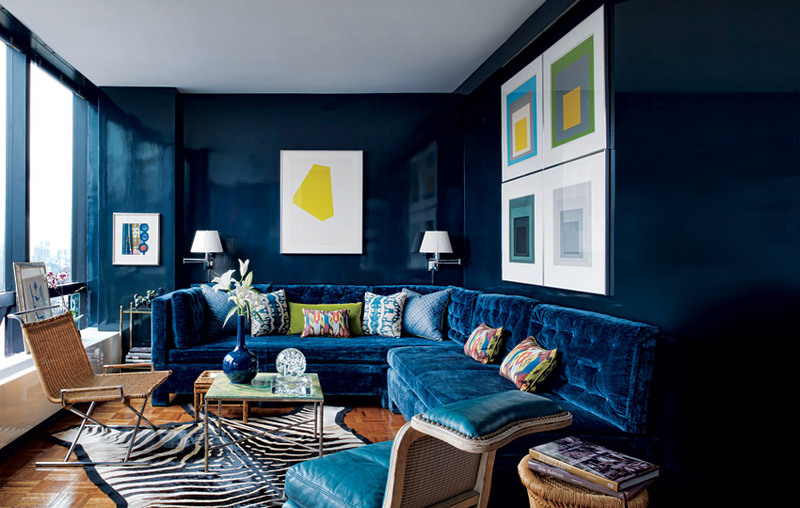 A room with bright and blue glossy walls enveloping a beautiful blue button-tufted velvet sectional sofa, a few modern arts, a blue classic leather chair, a pair of matching swing arm wall lamps, a sleek coffee table completed with a gorgeous zebra hide rug is key to a bold, chic and monochromatic space. Adding a splash of sunny yellow wall in a kid's room with a combination of yellow bed, a mixture of brightly colored decorative pillows, purple shag rug, hot pink coverlet and an interesting wall decal is the perfect touch for a bright and cheerful bedroom. Great blog - thanks for checking mine out. I'm your new follower. BTW, I have a giveaway going on now through thursday. That blue room is so stunning! can never have too much blue!